It's the time of year for self-tanner! In my opinion, there's 2 big times of year that are huge for self-tanning...holiday season, so that you have a healthy glow for your holiday dresses and parties, and spring. This is the time of year before summer when it's too cold (at least in most parts of the country) to get a natural tan. But since I plan to start wearing skin-bearing tank tops and skirts, I definitely want some help for my pasty winter skin! That's where self-tanners come in. 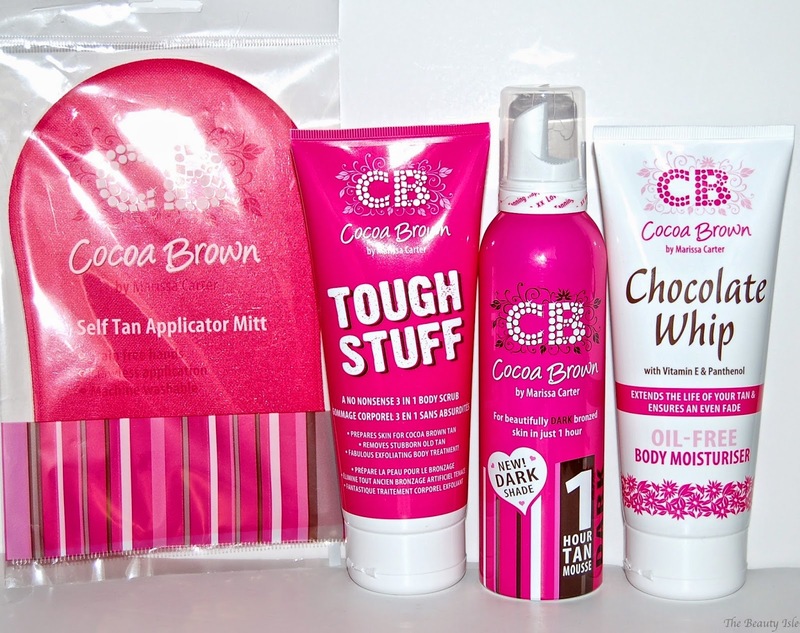 I was recently able to try a new-to-me brand from Ireland called Cocoa Brown Tan. They are the UK's best selling tanning brand and just started selling their products at Ricky's NYC and Miami. I was able to try their 1 Hour Dark Tan Mousse, the Chocolate Whip Body Moisturizer, and Tough Stuff Body Scrub. A no-nonsense scrub for rough areas of the body – perfect for the feet, ankles, knees, elbows and hands. This amazing exfoliating scrub is brilliant to prepare the skin for tanning, removing stubborn old tan and of course, leave your skin silky smooth. This is a pretty intense scrub. I like to use it in the shower after cleansing with a regular shower gel. It's great for a deep exfoliation so it's perfect to use before applying self-tanner or to get the last remnants of self-tanner off. Using Chocolate Whip Oil-Free Body Moisturiser as part of your tanning regime will ensure your Cocoa Brown tan fades slowly and evenly. Most body lotions currently on the market contain oil, which causes your tan to fade unevenly. Mousse based tans, like Cocoa Brown, are usually water based and as we all remember from our science classes – oil and water just don’t mix! This is a great body moisturizer. It smells like a wonderful mix of gardenia and a bit of chocolate. Cocoa Brown recommends applying this to rough areas such as elbows and knees before applying the Cocoa Brown Tanning Mousse. You can also apply this daily to ensure an even fade to your tan. A light-weight, fast drying, non-sticky mousse giving rapid streak free results. No need to sleep in your tan and ruin your sheets! This self-tanning mousse has absolutely no scent whatsoever which is amazing! I know in the description it states that it has a gardenia scent but I don't detect that at all. The 1 Hour Dark Tan Mousse is best applied with a mitt and it dries fast so you really have to work quickly to massage it into your skin. You can see some color right after application but it's best to leave it for 1-3 hours depending on how deep you want your color. I apply it before bed and since it dries so quickly, I can get right into bed without ruining my sheets or making them stinky! The next morning I have a gorgeous glow to my skin. You can purchase the mitt HERE for $6.99. Below is a photo of the mousse in action. In the photo below I only applied the mousse to my right leg. You can see the gorgeous glow it has given overnight. I loved everything I tried from Cocoa Brown! The 1 Hour Dark Tan Mousse is my favorite because it it's not the least bit sticky or stinky and it gives me a gorgeous tan! 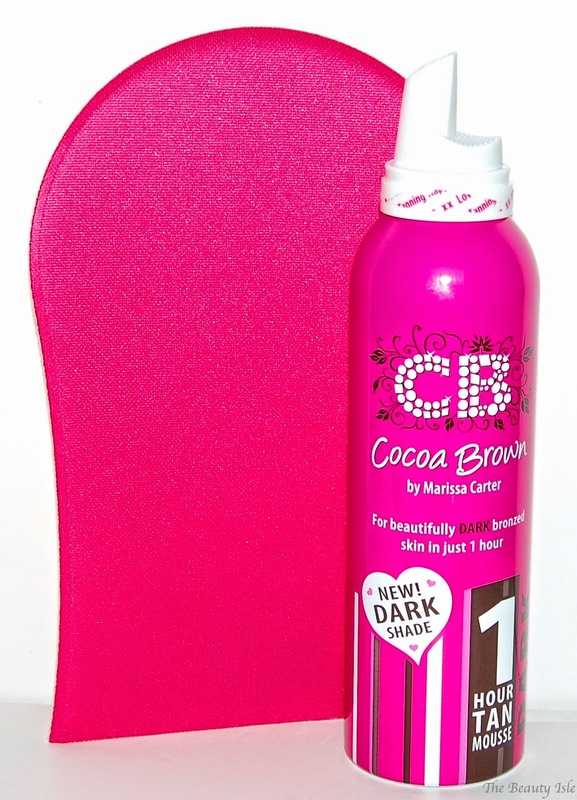 In the US you can purchase Cocoa Brown products online HERE or at Ricky's stores. In other countries, please click "Where to Buy" on the Cocoa Brown website to find out where you can buy Cocoa Brown products.